Lions, the iconic symbol of the African wilderness, are in grave trouble – they have disappeared from over 90% of their range and there are now fewer lions left than rhinos. Global interest in lion conservation – and particularly the role of trophy hunting in their decline – peaked in July 2016 with the killing of Cecil the lion (a WildCRU study animal). Given that the UK imports up to three lion trophies a year, in 2016 Rory Stewart, the British government’s then Under Secretary of State for the Environment, invited Oxford University’s Professor David Macdonald to review trophy hunting and to suggest how the Government could act to enhance lion conservation, including identifying the criteria that might be applied to applications to import lion trophies to the UK, and mindful of the need for hunting to avoid detriment to, and encourage enhancement of, lion conservation. You can read a summary of the Report’s findings below, and you can download the whole report from https://www.wildcru.org/news/new_report_lion_conservation/ – read the Preface to understand its impartial approach, and then the Executive Summary for a quick overview of the facts. Question: What is your personal view on trophy hunting? Professor Macdonald replied: “The big issue here is lion conservation and how it can realistically be achieved. Whether or not I personally like lion hunting is irrelevant to evaluating the evidence of its contribution to lion conservation in the face of the species’ catastrophic decline. Having worked closely with these glorious animals for years, it is unfathomable to me that there could be joy in killing them, but for me the priority is halting, indeed reversing, their decline which arises largely from habitat loss, conflict and poaching, and currently the evidence is that trophy hunting contributes to keeping hundreds of thousands of square kilometres available to lions and other wildlife, so an alternative way of paying for that land to remain open to lions must be found before further jeopardising the already shrinking lion range”. He added, “The world is full of uncomfortable facts, and it’s more fruitful to think how to make the best of them than to rail against reality. Brexit exists, so does poverty, tropical forests are being lost, so are lions, more land is maintained for African wildlife by hunting than by national parks: a lot of people may wish fervently that none of these things were the case, but they are, so in terms of hunting lions, WildCRU’s report asks how can we make the best of it. If we want to change the world, and I do, let us be alert to the risk that policies applied impulsively could have perverse consequences. We must be careful that the intention to improve lion conservation does not result in worsening it. If society judges trophy hunting lions unacceptable, but also concludes that it benefited lion conservation, then this dilemma might be approached via a journey to find ways of replacing the benefits of hunting before jumping to end them”. Question: Is media attention helpful? David Macdonald said: “I am so pleased that our work has drawn public attention to the crisis in lion conservation – as I’ve said before, the Cecil Moment needs to be turned into the Cecil Movement if lions are to be saved and I turn to the global public to help: Lions have already lost 90% of their historic range and in just three lion generations our evidence is that their numbers have declined on average by 43% and by much more in West and Central Africa. This is horrific. The main threats to lions arise ultimately from habitat loss, so the big problem is that maintaining habitat for lions, and other wildlife costs money. The question that cannot be dodged is “Who is going to pay?”. At the Cecil Summit we put this question to some of the best environmental brains in the world, and the short answer was that developed countries must assist less developed countries to deliver both the well-being of their wildlife and the well-being of their people: I call it conservation-led development”. Question: How does this new report advance lion conservation? Question: What is the priority for lion conservation? Professor Macdonald was supported strongly by a team of highly experienced conservation biologists at WildCRU. The team benefited from evidence and opinion offered by a diversity of organisations. Members of the core team contributing to this report have done so strictly from a position of professional neutrality that is neither pro- nor anti-hunting, although they are united in being pro good evidence and anti bad management of lion populations. The report notes that the primary threats to lions (which vary regionally), are habitat loss and degradation, loss of prey base and conflict with people over livestock. These threats are likely to intensify with climate change and rapidly increasing human population, predicted to double in Africa by 2050. Trophy hunting of lions, currently practised at a significant level in at least 12 countries, can negatively impact some populations, especially where it is poorly managed and additive to other threats. The number of wild lions trophy-hunted is hard to establish: between 2006 and 2015, CITES recorded 4474 ‘wild’-sourced lion trophies exported, but the average annual figure of about 450 “trophies” does not equate to the number of wild lions hunted because several body parts from the same lion may be recorded as separate exports. The report concludes that where trophy hunting is well-regulated, transparent and devolves sufficient authority to the land managers, it has the potential to contribute to lion conservation, but in many countries, poor governance and weak regulation can lead to unsustainable trophy hunting. The report concludes strongly that the most fundamental benefit of trophy hunting to lion conservation is that it provides a financial incentive to maintain lion habitat that might otherwise be converted to non-wildlife land uses. It has been estimated that trophy hunting areas (not all involving lion hunting) cover 1.4 million km2 – 22% more land than National Parks – in Africa. How much of that area could viably be converted to phototourism is unknown, but this certainly could not be accomplished everywhere. The revenue generated by trophy hunting is debated, with estimates of >$200 million in gross revenue annually across sub-Saharan Africa. Lion hunting probably accounts for 5-17% of that income, depending on the country. Overall, the trophy hunting industry is not heavily dependent on lions for its financial viability, but if lion hunting ceased, trophy hunting could, according to the only peer-reviewed published estimate (Lindsey et al.’s 2012), become unviable across approximately 60,000 km2. Beyond the scientific considerations synthesised in this report, there are ethical and pragmatic views that may be irreconcilable. Before deciding what to do about lion trophy hunting, individuals and nations need to know the facts, and indeed the gaps in knowledge. Providing these facts, and identifying important gaps, is one function of this report, and it is particularly important insofar as policies applied impulsively could have perverse consequences if the intention to improve lion conservation resulted in worsening it. In that case, even those implacably opposed to lion hunting on ethical grounds might favour a ‘journey’ rather than a ‘jump’. For example, if society judged trophy hunting lions unacceptable, but also concluded that it benefited lion conservation, then this dilemma might be approached via a journey to find ways of replacing the benefits of hunting before jumping to end them. – Trophies should be acceptable only from areas that are sufficiently large to offer conservation benefit to lions, and where the lion population is demonstrably well-managed. – Good management requires either adequate monitoring, which allows scientific quota-setting and shows a stable or increasing population, or age-based harvesting. 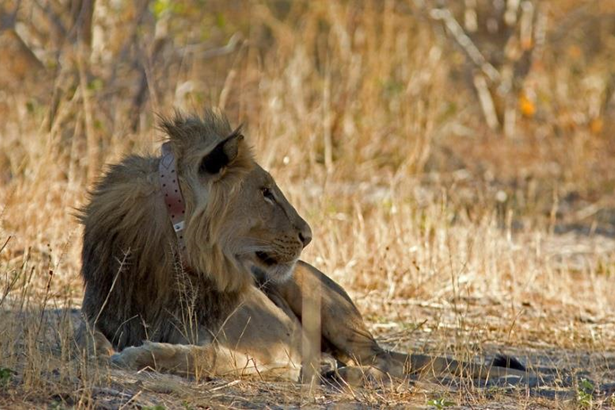 Age-based harvesting could include either the precautionary approach (0.5 male lions of >7 years per 1000 km2, with rest periods, unless there are good data showing it can withstand a higher level), or adaptive age-based quotas. The report explores in detail these options, and ends with a strong recommendation that failure to meet the required conditions would result in a moratorium on UK imports from the area until they are in place. – In areas where lion populations are declining unsustainably under any of the permitted harvesting systems, hunting should be stopped (but action should be taken to prevent the loss of that land from the wildlife estate. – These regulations, applied at the level of the hunting area, should be managed by an independent committee of stakeholders in each country. That committee should audit hunting practices, set and monitor quotas, encourage certification of hunters, ensure adequate training of professional hunters, ensure transparency and compliance, and verify the age of hunted lions based on hunt reports, photos and tooth X-rays. – Leases over hunting blocks should be long (e.g. 10 years and renewable) to minimise short-term profiteering. – Hunting blocks should be allocated according to an open auction system, to maximise competition. – Trophy hunting fees should only be applied following successful hunts, thereby reducing the incentive to kill inappropriate individuals. – Professional hunters should be strictly accredited as evidenced by membership of internationally recognised associations that put standards first and foremost (including those of marksmanship and animal welfare), and will conduct investigations into reports of misconduct and expel guilty members. Membership with such an association should be necessary to market hunts. Finally, broader scale analysis of imports and exports of lion trophies is an essential element of monitoring the industry and its impact on conservation. – CITES procedures should be adjusted so that it is possible to assign various body parts to a single trophy lion (thereby avoiding the double-counting of, say, the pelt and skull of a single animal), and to track successive re-exports of that individual. These recommendations, based on an impartial review of the scientific evidence, represent feasible steps for minimising risk of adverse effects of trophy hunting on lion populations, while ensuring that where trophy hunting occurs it contributes significantly to the benefit of lion conservation. This is important, but the UK government, and its partners and collaborators in this grand vision, will also need to invest heavily in tackling even greater issues beyond trophy hunting to secure the long-term future of this globally iconic species.